When your goal is to increase sales, it’s easy to get hung up on those critical moments right before you clinch the deal. Maybe you’re focused on improving how you respond to sales objections, honing your negotiation skills, or perfecting the close. But your ability to close isn’t the only sales activity impacting your win-rate. Although the final steps of your sales process are certainly vital, increasing sales starts with how you generate and manage leads and opportunities. More specifically, one of the most important aspects of your sales strategy is how you find, qualify, and nurture your leads. So, if you want to move leads through your pipeline more quickly, here’s what you need to know about sales lead management. Sales lead management is the process of finding, tracking, qualifying, and nurturing sales leads until they’re ready to be handed off to a quota-carrying sales rep. The steps you take to turn a potential prospect into a full-fledged, vetted sales opportunity are known as a sales lead management system. 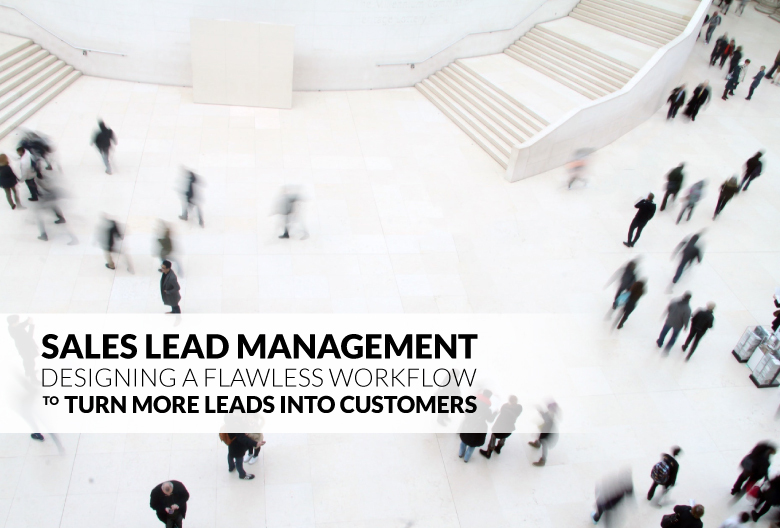 Setting up a seamless sales workflow starts with better lead management. So, let’s take a look at what each step of your lead management system should entail. Depending on who you ask, lead generation can be considered a precursor to lead management or the very first step in the process. This holds true for both outbound and inbound sales activities. Outbound lead generation typically starts with putting together a list of potential leads and collecting their contact information. For inbound sales and marketing teams, this stage is more about incentivizing leads to reach out in some way. For instance, including a strong call-to-action on every page of your website can help you capture (and learn about) potential leads. These are all ways of identifying and capturing leads who are already visiting your website. In addition to finding out who your leads are, you also want to pay attention to what they’re doing. The more you know about how a lead interacts with your website, the better you can tailor your messaging, outreach, and sales pitch to appeal to their needs. Though this is often considered the second stage of sales lead management, tracking can actually begin before you even know a lead’s name. By tracking how anonymous leads interact with your website (what content they’re reading, which pages they visit, which buttons they click on, etc. ), you can start to piece together a profile for each person who visits your site. If you combine lead tracking with lead capture forms on your website (like the gated content discussed above), you can attribute visitor actions to an individual, thereby turning anonymous visitors into viable leads. Plus, keeping tabs on your leads’ actions and behaviors allows you to more accurately determine where they are in the buyer’s journey. Scoring your leads is crucial to the qualification process. A solid lead scoring system weighs different factors to evaluate how likely a lead is to buy from you. This can include the prospect’s job title, company size, opportunity size, actions taken, goals, and pain points. The ability to pick out high-quality leads allows you to focus your resources on your best opportunities and streamline your team’s performance – which can boost your sales velocity and bottom line. Once you’ve scored your leads, you can decide how to proceed. Whether they should get passed directly to a sales rep or added to a drip campaign depends on how far along they are in the buyer’s journey. In most cases, qualified leads fall into one of three buckets: information qualified leads (IQLs), marketing qualified leads (MQLs), and sales qualified leads (SQLs). Both IQLs and MQLs require additional nurturing in the form of educational content, informative and persuasive drip campaigns, or possibly a conversation with a sales development rep. Sales qualified leads (SQLs), on the other hand, are almost ready to buy and can be passed along to a quota-carrying sales rep. Although some leads require more nurturing than others, basically all of them will need more than one interaction before converting into customers. However, you need to make sure you tailor your nurturing activities to match a lead’s current needs. For instance, MQLs are most likely to benefit from informative content designed to help them understand the benefits of your solution. SQLs, on the other hand, might be ready for a sales pitch or an offer to start a free trial of your product. Do you ever wonder why two seemingly similar leads can have such different journeys through your sales pipeline? Maybe one of them seems to fly through the first several stages but then stalls at the very end; while the other moves at a slow, steady pace – and ultimately closes faster than the first. Sales lead management is the key to understanding how and why leads move through your pipeline at the rate they do. More importantly, a good sales lead management system will help you identify better leads, refine your sales process, and optimize conversions. Whether you’re new to sales lead management or are looking to refine your process, here are a few tips to help you do it better. One of the main goals of sales lead management is to analyze your leads so you can better pinpoint and target your ideal customers. The more you learn about your target demographic and buyer personas, the more precisely you can tailor your lead generation efforts, increase conversions, and, ultimately, turn more of your leads into actual customers. So, if you haven’t already, take some time to define your ideal customer based on the shared traits of your top five to ten existing customers. This should include demographics (like where they live and work; what industry they’re in; the size of their company; who their customers and partners are) and behaviors (like what they’re reading on your website; how they found out about your products; which content they’ve downloaded). Prospects who fit into your ICP are the ones who are most likely to convert into paying customers – which means you can focus your efforts on the most viable leads and move deals through your pipeline more quickly. If you know where your best leads are coming from, you can focus more of your efforts on targeting the highest-value channels and sources possible. This allows you to optimize ROI and improve productivity. Otherwise, you could be wasting time on sales territories and channels that don’t produce quality leads. So, once you know who you ideal buyers are, work backwards from there to find your ideal leads. Ask your top customers how they found out about your product or brand and use website tracking to determine which channels or pieces of content tend to bring in the best leads. Make an effort to re-evaluate your lead sources on a regular basis to ensure you’re still prioritizing your most lucrative channels. There are other factors that influence how you should manage a lead besides source. You can beef up your understanding of your leads by researching prospects and their companies via prospecting tools, social medial, their company blog, and the “About Us” section on their website. Record all relevant information about a prospect in your CRM, so you never lose track of your opportunities or forget a key detail about a potential customer. The more information you have about your prospects, the better your odds of making a connection and building rapport. And if you can pinpoint exactly how far along each lead is in the buyer’s journey, you can personalize your outreach and lead nurturing efforts. You wouldn’t move many prospects through your pipeline if you used the same generic sales pitch on everyone – and the same thing can be said for outreach and lead management. According to data from MailChimp, segmented email campaigns get 100% more clicks than their non-segmented counterparts – not to mention more opens and fewer bounces. So, rather than blasting your entire contact list with the same message, segment your leads based on industry, buyer persona, and how far along they are in the buying process. By segmenting your list by demographics and by stage in the customer journey to ensure you only send relevant, timely messaging to each prospect. For instance, SQLs might appreciate an offer to test drive your latest product as soon as it launches, while MQLs might be more interested in a case study that highlights how a similar company benefited from implementing your solution. 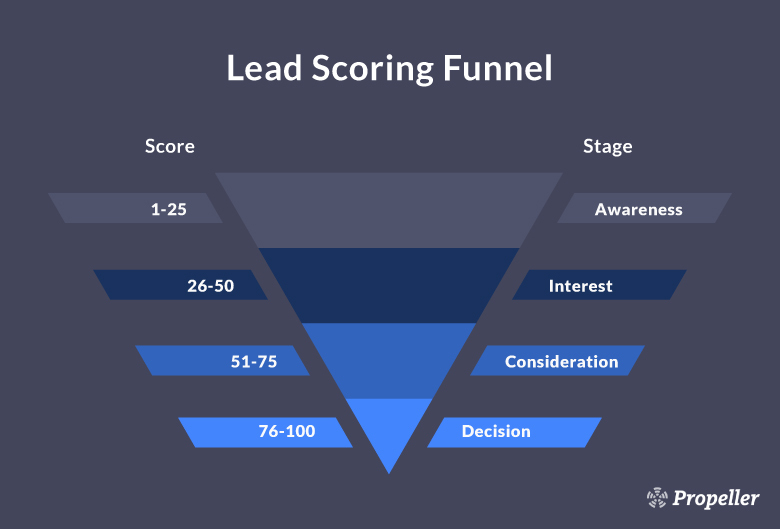 Lead scoring reveals a lead’s potential to become a paying customer. You can either build off an existing lead scoring system (like the BANT framework, for example) or develop your own method from scratch. Whatever criteria you decide to use to score leads, it’s important to get your entire sales team onboard and using the same system. This ensures your leads are all scored accurately and fairly based on the same factors. One of the keys to lead scoring is asking insightful questions to help you understand your prospects. By engaging with them in a two-way dialogue, you can determine how closely a lead matches your ideal customer profile, how far along they are in the buyer’s journey, and what you can do to tailor your offering to meet their needs. Ideally, you should ask questions that encourage leads to reveal how your solution could apply to their situation. Sometimes, a lead will get stuck in your pipeline. It could be that the lead isn’t a good match for your product, doesn’t have the budget available to make a purchase right now, or they’re just too busy to take your calls. If it’s obvious an opportunity isn’t going to pan out any time soon, you can pause, remove, or try to breathe new life into stalled deals. This keeps your sales pipeline flowing smoothly. However, if a noticeable bottleneck develops at a particular stage in your pipeline, that’s a sign your sales process needs some work. Make it a habit to review your sales pipeline often to see if deals tend to get stuck at one stage or another. While you don’t want to pressure leads to make a decision before they’re ready, creating a mild sense of urgency can up your open rates, click-through rates, and lead to more sales. For example, you could email sales-ready leads with a limited time offer or a discount code that expires in the near future. Whatever you use to motivate leads to take action, try to focus on creating added value for making a purchase more quickly. A good CRM platform is more than just a tool for tracking leads and customers. You can use your CRM to measure and manage every aspect of your sales process – and turn those data points into strategic decisions. With customizable sales dashboards and reporting, you have the power to uncover new insights about your leads and sales activities. Not only does this help you pinpoint high-value leads, but it also ensures you’re making the most effective use of your time possible. Lead management sits at the intersection of marketing and sales. If you want to take full control of your leads and sales pipeline, a platform like Propeller CRM can help you get there. Find out what a powerful CRM can do for you – start using Propeller for free today.